I Wouldn't Advice You to Do It. Written and sung by Joe Hart. For I wouldn't advise you to do it. Beecher he prays and sings old-fashioned chants. But I wouldn't advise them to do it. For her acting gives us a terrible pain. So 1 wouldn't advise her to do it. Ben Butler went out the other night on a tare. But I wouldn't advise him to do it. 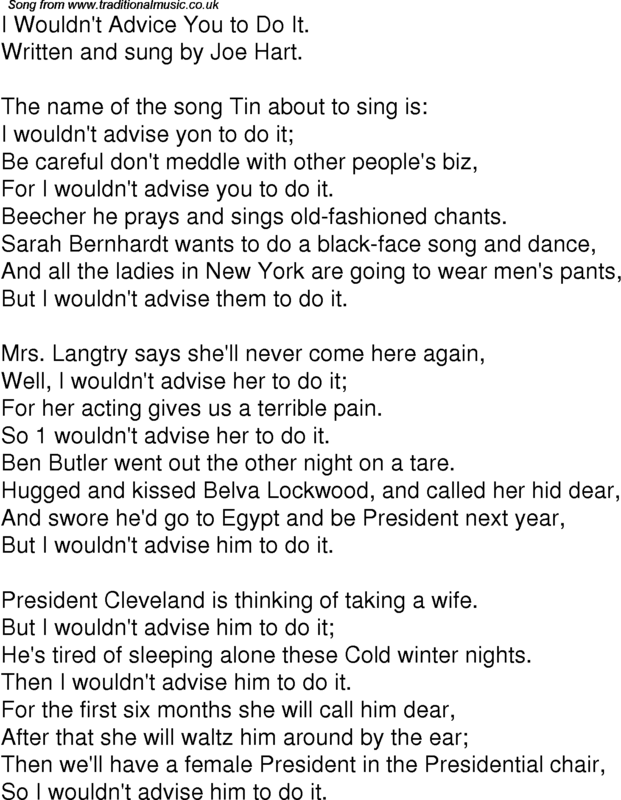 President Cleveland is thinking of taking a wife. He's tired of sleeping alone these Cold winter nights. Then I wouldn't advise him to do it. So I wouldn't advise him to do it.